Building on the success of our legendary SR24•4 mixing console, Mackie is proud to introduce the new Onyx 24.4 24-channel / 4-bus live sound console. While retaining the same convenient footprint as its predecessor, the state-of-the-art Onyx 24.4 brings dozens of new features and enhancements to the table: 100mm Panasonic® faders, premium Onyx mic preamps, completely redesigned analog circuitry with more headroom, greater routing flexibility, new Perkins EQ, and a built-in assignable stereo compressor/limiter. And we're barely scratching the surface. The Mackie Onyx 24.4 leaves the competition in the dust when it comes to sound quality. The difference starts with premium Onyx mic preamps on every channel (click here for an interactive tour of the Channel strip), which offer greater dynamic range and transparency versus any other mixer mic preamp on the market. Newly designed 4-band Perkins EQ offers the sweet, musical sound of the legendary British consoles of yesteryear, yet with greater filter control. And while the 24.4 is not the first mid-format console to offer an onboard compressor/limiter, we specified a THAT® Corporation 4301 assignable stereo compressor/limiter, and then had it custom tailored specifically for the Onyx 4-bus Series. Finally, overall mixer sound quality and headroom has also been raised, thanks to the use of premium components, completely redesigned summing bus circuitry, and an electronically balanced design throughout the entire signal chain. Add it all up, and the Onyx 24.4 gives you big, full-range sound and even lower noise than esoteric mixing consoles costing much more. Although our highly-acclaimed XDR mic preamps set high standards for quality and performance, Onyx mic preamps offer even greater fidelity, headroom and transparency—as well as better radio frequency (RFI) rejection and wider dynamic range than ever before. Numerous magazine and online reviews have confirmed Onyx preamps sound just as good as many “boutique” standalone mic pres—with specs like 123dB total dynamic range, -129.5 dBm Equivalent Input Noise, and 0.0007% Total Harmonic Distortion. Click here to learn more about Onyx mic pres. We called on veteran audio engineer Cal Perkins to develop the EQ circuitry for the Onyx Series, and in turn Cal designed an extremely effective and musical 4-band EQ, with sweepable low- and high-mids—perfect for live sound mixing. Called the Perkins EQ, Cal's new circuitry builds on the classic Wein Bridge circuit used in the British mixing desks of the '60s and '70s, providing greater filter and phase shift control. Perkins EQ offers more control over harmonic content than any other EQ on the market, and it's only available on Mackie products. Compression is an indispensable tool in a sound engineer's arsenal. That's why we integrated a high-quality master compressor/limiter chip from THAT® Corporation into the Onyx 24.4. This assignable compressor/limiter is perfect for tightening up vocal harmony and balancing drum kits. Controls are provided for Threshold, Ratio and Fast/Slow Attack, and the compressor can be assigned post-fader to the L/R main mix (for system limiting and speaker protection) or pre-fader to Group 1/2 or 3/4 outputs (for grouped signal compression, like drums or background vocals). If total control over signal routing, talkback/monitor mixing, and external effects processing is what you seek, then look no further—the Onyx 4-Bus Series Master section has everything you've come to expect from a Mackie mixing console, and more. 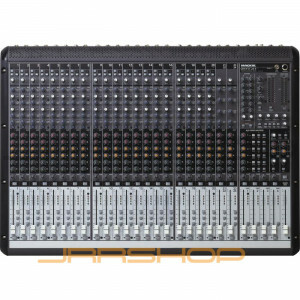 The onboard 6 x 2 Matrix Mixer is the solution to the “not-enough monitor send” blues. Not only can you use the Aux Sends to generate up to six monitor mixes, but the Matrix Mixer can be used to generate two additional independent mixes—ideal for IEM (in-ear-monitor) systems, cry rooms, green rooms or other zoned outputs. Visual monitoring of Solo, Main output and compression/limiting is expertly handled via four, giant 12-segment LED ladders. And even the Sub Groups feature 4-segment LEDs, so you know what signal levels are at glance. If you plan to use the Onyx 24.4 for live recording, we've included another invaluable feature: convenient balanced Mic/Line direct outputs for every channel. No longer will you need to run a splitter, or take individual direct outs from the board to your tape or hard disk recorder. Thanks to three DB-25 female connectors (configured with standard Tascam® pin outs) on the rear of the console, you can quickly route all mic/line signals to an external device. All of these balanced direct outs are pre-fader and switchable via internal jumpers as either pre- or post-EQ. So there's only three cables between the Onyx 24.4 and your recorder—it just doesn't get any easier than this. Because we at Mackie know how tough the road can be on equipment, we designed the Onyx 4-Bus Series to handle almost anything you can throw at it. Vertical aluminum supports are placed strategically to maximize the structural integrity of the solid-steel chassis. And because these boards get moved around a lot, we designed comfortable carry handles right into the sides—even though they are portable enough to just tuck them under your arm and go. Designed with a practical and easy to understand layout, anyone from a Sunday morning volunteer operator to a seasoned professional engineer can quickly learn to operate the Onyx 24.4 console. This makes it perfect for a wide range of live applications including churches, small- to medium-sized clubs, touring bands, and rehearsal facilities, just to name a few. With stunning sound quality and renowned Mackie engineering—combined in a full-featured, portable, highly affordable, mid-format mixing console—the Onyx 24.4 is destined to set the new standard.